Recently, I harvested my first potatoes of the season. It’s one of my favorite gardening “chores.” As silly as it may sound, to me it’s like a treasure hunt, running my hands through the dark earth in search of jewels. Digging for treasure in the potato bed. Yesterday I harvested my first potatoes of the season. It’s one of my favorite gardening “chores.” As silly as it may sound, to me it’s like a treasure hunt as I run my hands through the soil in search of purple and red jewels in the dark earth. This year’s crop includes purple-skinned Caribe and red-skinned Reddale. In addition to the potatoes in my vegetable garden, I’m also growing them in a Grow Bed and in some Grow Bags. If yesterday’s harvest is any indication, I’ll be swimming in ’taters at the end of the season. As much as I love potatoes, I can only eat so many of them right now. Ditto beets, carrots, and turnips. Fortunately, root crops are a humble lot. They’re content to wait until the prima donnas of summer — tomatoes, peppers and cucumbers — have passed their prime. Wait, that is, as long as you store them properly. Root vegetables, such as carrots and beets, will keep all winter and even grow sweeter in the Root Storage Bin. The heavy wire frame has a replaceable liner. Back when farm families needed to store enough vegetables to get them through the winter, they built root cellars, where crops could be kept moist and consistently cool. If your goals are more modest, try storing some of your root crops in a Root Storage Bin. The wire sides allow for good air circulation and the burlap liner keeps out the light, both of which are important for extended shelf life. Potatoes can be stored loose, right in the liner. 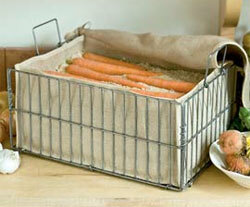 To store carrots and beets, fill the liner with moist sand and layer the vegetables inside. 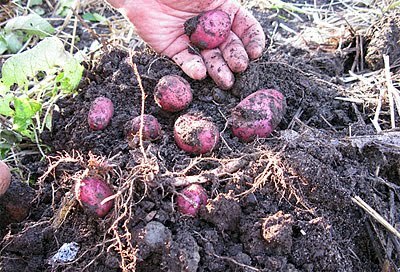 To learn more about storing root crops, as well as onions, garlic and winter squash, read the article on keeper crops. Do you have any surplus vegetables? Good post on the growing popularity of barter in the food world. I must have done something wrong–only had 12 med sized potatoes. Weather was good, soil was good, plants looked healthy. I used about8 seed potatoes, am thinking I should have added potatoes each time I added soil. I hope you’ll try again next year. There are several potato bags still growing in our display gardens (both regular potatoes and sweet potatoes). Once they’ve been harvested we will be adding a post about our results. Yields for regular potatoes in the potato bags are affected by many factors, including the variety of potato, amount of moisture available, etc. Yields in the range of 7-8 lbs. are fairly typical. I purchased bags for my dad and a cousin. My dad had a big beautiful plant but harvested 5 small Yukon gold potatoes. He was hugely disappointed as was I. I encouraged him to try sweet potatoes next year, but he said he’d just use it for something else. I still need to find out how my cousin did with his bag.